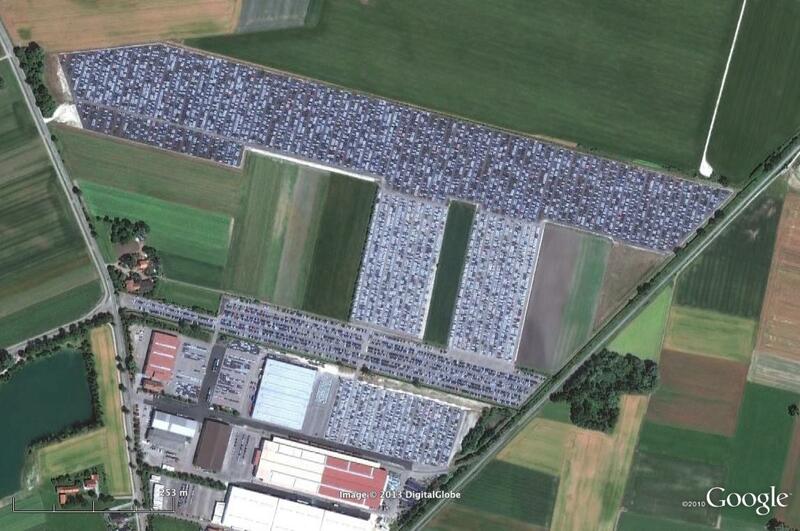 In this Google Earth image we can see thousands of 2 or 3 year old Audis being left to rot. The reason is 'channel stuffing' - or manufacturers making far too many cars than the market will support. The cars come to the end of their leases and get taken to graveyards such as this to die. If they were auctioned off they would impact on both the used car market and the new car market (by drastically affecting residuals). There's also a far more sinister reason for their existence - to maintain a high priced spare parts market. Those massively overpriced spares that come out of the manufacturers would drop in price were all these cars to flood the market and be stripped for their components. A sad fact of life - and a reflection that, despite the UK market being buoyant, the European car market is on its knees. There's a Google Maps interactive window under the image so you can explore the Audi graveyard.